Commercial vehicles have always been a driving force for the Indian automobile industry. While India stands on number six for their manufacturing, the industry is filled with great potential to make the country shine on world map. Despite of a fall in the last fiscal, the current financial year is expected to bring some positive transformations in the industry. While eyeing on the new government to introduce affirmative policies, the industry hopes to see better days in the near future. Looking at the pre-owned segment of commercial vehicles, the area remains largely untapped by well-structured and trustworthy players. 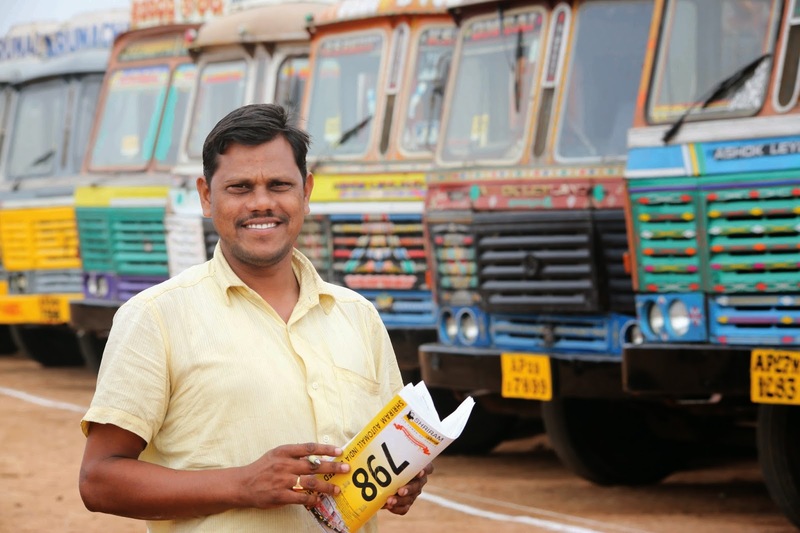 People are majorly dependent on the roadside dealers to carry out their transactions. In fact, most of them do not involve anybody and the deal happens between relatives or friends. The absence of experts in between deals generally results in inappropriate realisation on assets. Loss mostly remains the adjective of such transactions. Such a scenario demanded nothing but the presence of a mediator, which stands aggressively on the values of trust and transparency. In the hunt of a well-structured arena for pre-owned vehicles and equipment, Shriram Automall India Limited (SAMIL) simply transformed the way India carries out the exchange of pre-owned commercial vehicles. Hailing from Shriram Transport Finance Company (STFC), India’s largest asset financing NBFC, SAMIL carves the concept of its bidding platforms on Indian automobile industry with bold letters. It all began with a vision to walk on an unexplored road as a pioneer in the pre-owned segment of automobile industry. Soon after a humble inception in 2011, India witnessed the most exciting side of a revolution wherein people were gradually introduced to SAMIL’s physical bidding, online bidding, private treaty and one stop classified. Although, bidding existed in the online space for pre-owned vehicles but the beginning of Automalls (representing physical bidding) marked a moment worth creating history in this space of the industry. An excursion within SAMIL’s Automall captures a day full of action and excitement. It all starts with registration and then the commencement of a mega bidding event. While marking the presence of hundreds of bidders, the pre-owned vehicles and equipment, including commercial vehicles, construction equipment, tractors, cars & SUVs, 3 wheelers and 2 wheelers, walk a ramp in the bidding process. With numbers audible from every corner of the bidding hall, the area transforms into a space full of enthusiasm. contributes in the enhancement of an asset’s value to a great extent. Apart from the refurbishing area, the wide space of SAMIL’s Automall also houses a One Stop Classified and a wide parking space. Equipped with a computerised touch screen interface, the one stop classified machine contains information on a number of inventories available across the country. And, a parking space is mainly constructed to ensure a secured and safe environment for all the vehicles and equipment available with SAMIL for disposal. SAMIL’s presence in new media captures the real expression of comfort and convenience. The Company also facilitates online bidding through its Online Bidding Events Portal. A quick glance through the space will introduce you to an extensively wide range of pre-owned vehicles which is hardly available on any other space in the World Wide Web. The private treaty of SAMIL incorporates negotiated deals in which the Company acts as a mediator between the two parties. With the expertise of best brains from the industry, it gives a well-structured facet of professionalism to its every deal, covering majorly its construction equipment segment. The biggest challenge in a pre-owned vehicle’s exchange is the identification of its correct value. No matter if it’s a buyer or a seller, an inappropriate valuation of asset affects both of them. SAMIL provides an ultimate solution to this as well through its Valuation service. No vehicle is served under the Company’s name at an inappropriate price. Every penny is calculated while keeping the market trend and a vehicle’s present condition in mind. Taking a look at the current business world, it portrays evolution in its true sense. The trends keep on changing with every passing day. SAMIL also participates in the race by sprouting innovation in every step of offerings. In an endeavour to make participation in its bidding events easy and effortless, the Company serves Privileged Bidder Cards, including Star Bidder Card, Premium Bidder Card and Platinum Bidder Card, under its Driving Your Trust programme. Along with these cards, SAMIL also serves special benefits to its customers from time to time. Apart from the end users, SAMIL has also been associated with banks and automobile manufacturers to facilitate the disposal of their pre-owned vehicles. In this area, the Company has enhanced its clientele to a great extent with the incorporation of major players from the industry, including SBI, Tata Motors, John Deere, to name a few. The corporate view of SAMIL showcases a major contribution in the transformation of Indian automobile industry whereas, the other side of the Company is writing a quite bright story for India’s future. Through an association with Shriram Foundation, SAMIL has supported the educational expenses of several students across India through scholarships under its Education Scholarship Programme. Catering to the ever-evolving arena of automobile industry, SAMIL keeps itself abreast with the dynamic global trends. With its innovative initiatives, the Company has always leaded its journey as pathfinder. While making a mark on the national platform, the various arms of SAMIL will continue to aid the Indian automotive market forever. visit samil.in for more information. Tata Motors is planning to extend its reach across India by doubling the dealer network by 2020. For the expansion drive, the Company is targeting both rural areas and urban cities in order to get a dominant position in the Indian passenger car market. Currently, it has 500 touch points in the country and the plan is to add equal number of dealerships. By 2020, the passenger car market is expected to reach 5 million units per annum from the 2.5 million market at present. Behind this impeccable journey lies the sheer determination of Mr. Sameer Malhotra (Director & CEO of SAMIL) who not only gave a commendable kick-start to this initiative but also made it reach top height within a mere span of three years. A veteran in the infrastructure, construction equipment and commercial vehicles industry, Mr. Malhotra has given 24 years of his expertise to the corporate world. With great strategic analysis and efficient management skills, the man has also served the world’s largest industrial auctioneer, India’s largest infrastructure finance company and India’s leading housing construction company. Aiming at a revolutionary entry, he had planned the introduction of SAMIL with an innovative concept of Automall for the exchange of pre-owned vehicles and equipment along with an objective to put an end to unreliable and conservative practices prevailing within the domain. Beginning with the first Automall launch in Chennai in 2011, the Company today enjoys a substantial presence across India with over 100 auction sites, including around 40 well-structured Automall auction sites. Through these auction sites and its online auction platform, the Company carries out nearly 200 and 400 auctions, respectively, every month. Apart from them, SAMIL’s one stop classified and private treaty contribute towards making it a complete solution provider within the market. Catering to a huge variety in the pre-owned construction equipment segment, including hydraulic excavator, wheel loader, rock truck, loader backhoe, crane, motor grader, crawler tractor, piling rig, pipelayer, forklift and many more, SAMIL facilitates their buying and selling in an extremely organized manner. Through well-structured bidding processes, high level of transparency and a team of qualified professionals, the Company gains an edge over other players in the Indian market. It is like a one-stop platform where every requirement related to pre-owned construction equipment is met with utmost passion for the segment. Driving in winters has its own fun. Just imagine yourself riding on those white lanes with snow all around. But, this kind of drive can be dangerous as well. With the onset of winter season, people get to experience the most adventurous ride of the year. But, adventure always comes along with a risk. A risk of life! Let’s go for an Adventure ride this winter season with a complete knowledge on all the precautions and safety measures. Before you go out for that exciting snowy trip, make sure that your vehicle is completely equipped with all the tools which can save you in case of an emergency. · Your car should have sufficient antifreeze. Your windshield must be spotless. · Check your headlights. They must also be clean and working properly. · Your car tyres must be fully inflated and have a strong grip. · Get proper tests done for your car battery. A non-working battery can get you trapped in the cold outside. · Always carry some extra batteries in your car along with a flashlight. Also, don’t forget to carry some warm clothes and a first aid kit. · Last but not the least; your mobile phone is the most important tool as it will help you connect with your near ones in case of an emergency. So, don’t forget it at home. 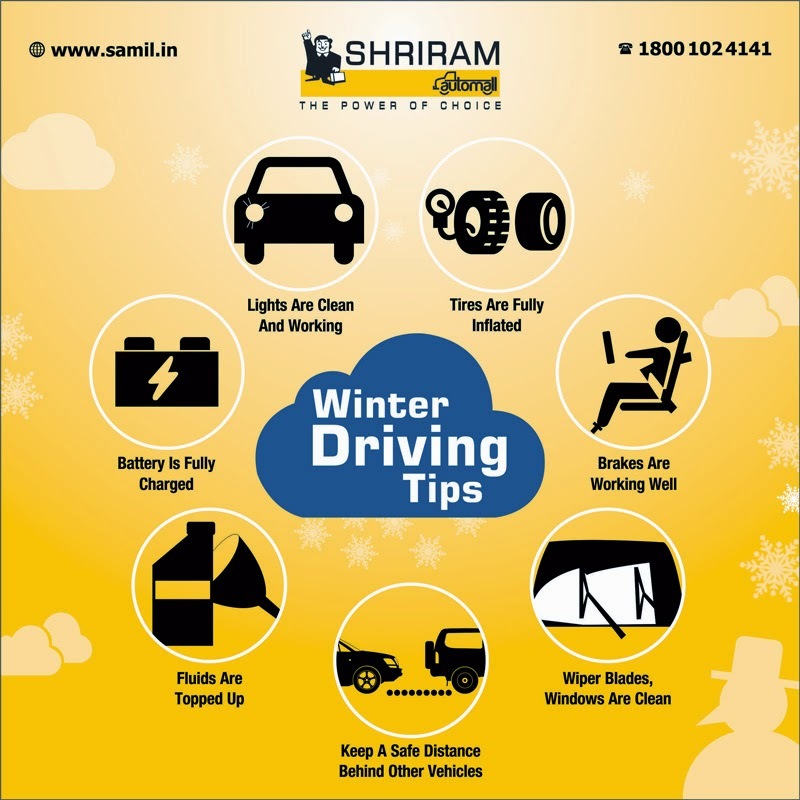 If you wish to go onto an adventurous ride this winter season but do not have a car, get in touch with Shriram Automall India Limited (SAMIL). The company offers a huge variety of pre-owned cars at nominal prices. Shriram Automall started its business with used commercial vehicles and later expanded into tractors, machinerys, cars, three-wheelers and two-wheelers. Today, the company has a strong association with brand corporates, manufacturers, banks, NBFCs, dealers and fleet owners. Though the organisation has made remarkable presence in the industry, it feels that educating the people on this model remains the biggest challenge.